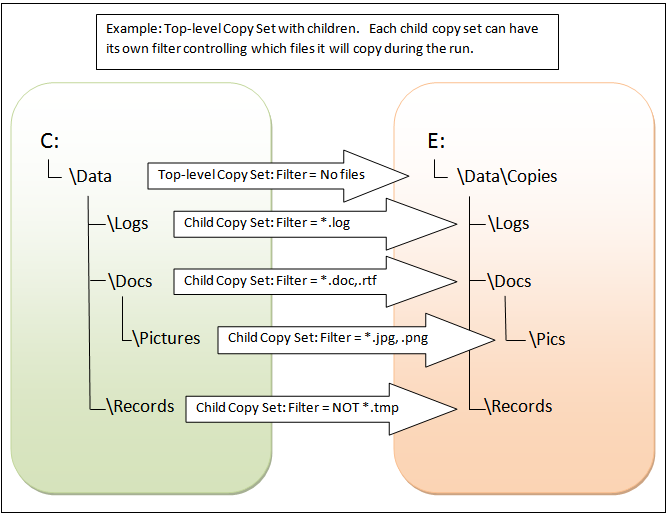 Copy files automatically; use file filters for precise control over which files are copied. Check out the 180-day free trial! Current Version: 1.2.3.0, released December 31, 2018. 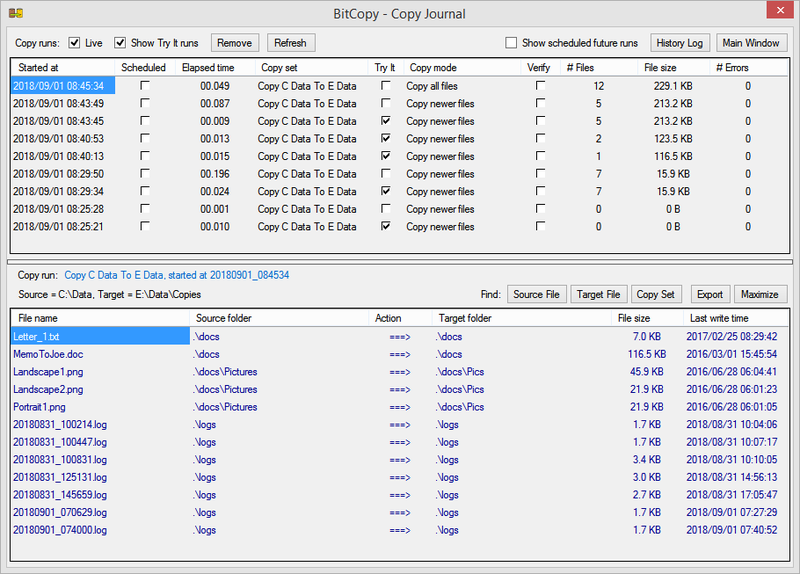 BitCopy is a file copy program for Windows. Say goodbye to XCOPY! 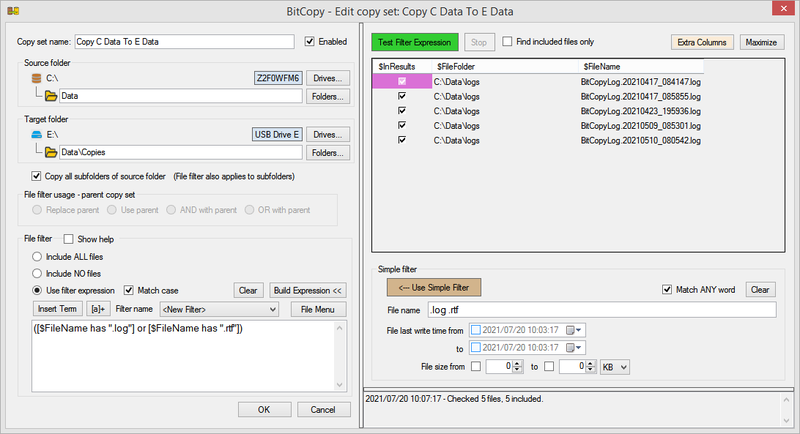 Use BitCopy to automate any file copy task with precise control over which files are included or excluded. 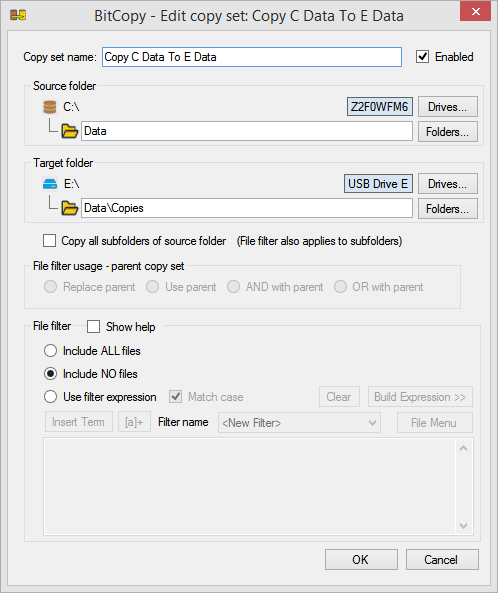 Create copy sets (jobs) to copy files between any local or remote directories. Select files to copy at each level of a directory hierarchy using a filter expression involving file name/path/date/size. Use AND/OR/NOT to build filters of arbitrary complexity. Use different filters for different subdirectories. Build and test filters interactively. Efficient and robust design can handle millions of files and terabytes of data in a single copy set. Overwrite only changed files, or always overwrite files, or never overwrite files in the target directory. Use "Try It!" mode to predict which files would be copied. Verify the copy job by comparing the actual contents (bits) of each source and target file after a copy, if desired. Each copy set can be run manually at any time, or automatically on a daily/weekly/monthly schedule; optionally wake the computer from sleep to run a scheduled copy. Copy Journal shows the complete past results (files copied and any errors) for all copy runs. See files being copied in real time for the current run. Enable or disable any subdirectory of a copy set individually; this lets you turn on/off any part of the copy job at will. Secure storage of logon credentials for network folders if desired. 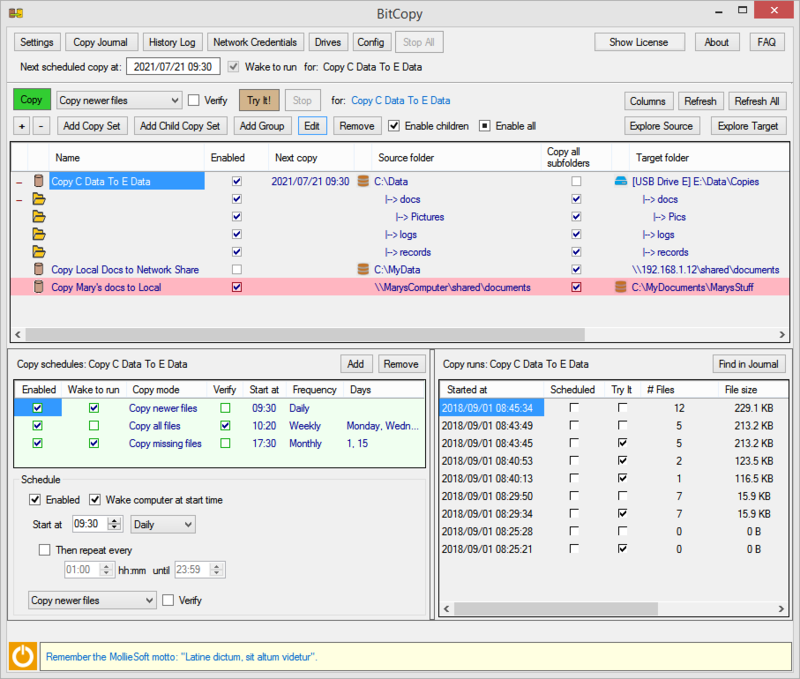 Try BitCopy free for 180 days! WinSleep by MollieSoft - Keeps your computer asleep when it is not being used. PodSilo by MollieSoft - a Podcast Downloader for Windows. BitSilo by MollieSoft - a Backup/Restore program for Windows. 100% CLEAN award granted by Softpedia! Read the 4.5 stars Softpedia review. 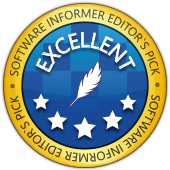 Read the 5 Star Editor's Pick award at Software Informer!!. 1.2.3.0 - No schedule can run while a dialog box is open. Update the statistics in the main window while a run is in progress. 1.2.2.0 - Allow a copy run schedule to repeat periodically after the start time, within any scheduled day. 1.2.1.0 - Added Copy Groups and Links to allow running a copy set with different source/target directories, or on a different schedule. 1.1.9.0 - Disallow terminating "\" for source or target folder names. Show the overwrite mode (always, never, with newer) of copy runs in the Copy Journal. BitCopy © 2018 by Marvin Hymowech.